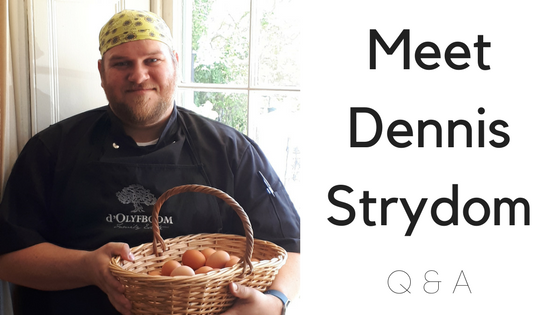 Dennis Strydom recently joined the d'Olyfoom team as Head Chef of The Well. We spent some time with him to find out why he loves what he does, how he came to be a chef and some other interesting facts. Q: Tell us a little bit about your career before you came to d'Olyfboom? A: I come from a family where food is important and my childhood memories often revolve around meals like Sunday lunch, wonderful smells from the kitchen and my granny's baking.My first job in food was at the Colony Restaurant , The Queens Hotel, Oudtshoorn and various positions followed until I ended up as Head Chef at Backsberg Wine Estate before being appointed at d'Olyfboom. I am married to Hannele, also a chef, so it's a household filled with food and experimentation. I am a self-taught chef, and love experimenting with comfort food. A: I love curries and make a point of creating my own spice mixes, which makes every curry different! We try to eat more healthily and Chilli Con Carne with lots of beans on sweet potatoes instead of nachos is a current favourite, for example.Often a simple change to a classic recipe can increase the healthy elements in a dish. On the other hand,I also love baking and my Gran always said if you can bake, you can cook!I bake a mean chocolate cake. Q: What are three ingredients always available in your kitchen? A:Cheese, Lemons and a recent "addiction", Chipotle Tabasco. Q: What is the one ingredient you can't live without? A: Salt. Exotic and flavoured salts yes – but just good old quality salt too. Q: What is your favourite kitchen implement? A: It used to be my knives, but I recently acquired a Thermomix – and I absolutely love it. Q: Which three famous people would you invite for dinner? A: Jamie Olivier, Heston Blumenthal and my Gran, especially as she passed away before seeing me as a chef. She would have been really proud. Q: What are your dreams for The Well? A: I look forward to creating healthy dishes, always keeping in mind that my style is Family Dining. Ideally I would like us to be as self-sufficient as possible for e.g. with bakery items and using seasonal produce. I like homely, wholesome, generous eating but served with restaurant flair. The Gut Reset Program - a wholesome way to a whole new you! Passover: Celebrating the Lamb that was slain!